Snakes and Ladders from mFortune brings back childhood memories of the classic board game in a slot game. As with mFortune’s other mobile slots the betting is fairly simple in Snakes and Ladders – it’s played out over 5 reels and 9 paylines, with betting starting at $0.10 a coin. The symbols include the Snakes and Ladders logo, a Cactus, a Bull’s skull, plus regular 10-through-Ace symbols. The Snake is the game’s Wild, substituting for all symbols except the Scatters. Five Wilds across the reels pays a 2,000x coin jackpot. So far, so mFortune. Free spins can be yours if you hit three or more Ladder icons on the reels. 5, 7 or 9 spins can be won for hitting 3, 4 or 5 Scatters respectively on the reels. This is the same kind of bonus you’ll see throughout mFortune’s mobile slots. 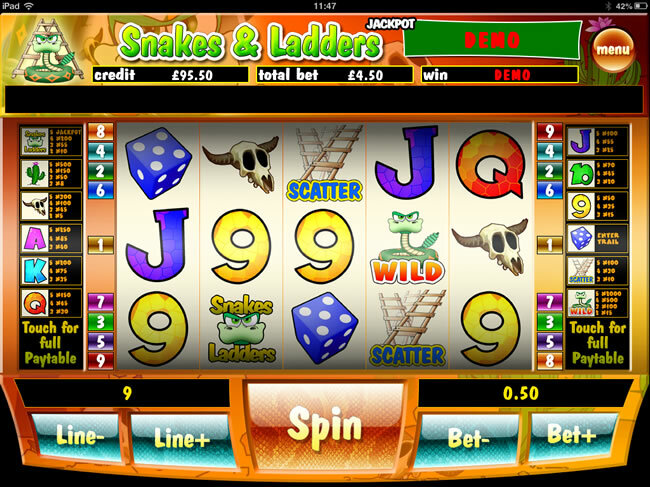 Two or more Dice icons on the reels, meanwhile, will trigger the main bonus – a kind of mini Snakes and Ladders game on your screen. Just like the traditional board game you get to throw the die and proceed around the board. Increasing multipliers on your win can be achieved. Finally, there’s a progressive jackpot that can be triggered by hitting five Snakes and Ladders logos across the reels – easier said than done. I'm a big fan of progressive jackpots so the inclusion of this is a massive plus for me. It’s fair to say mFortune know how to make simple slots fare for players on the go. While 9 paylines won’t set everyone’s world alight you know what you’re going to get. 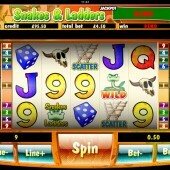 And what’s more, Snakes and Ladders offers a Progressive jackpot for players at the upper end of the betting spectrum. If you like the cut of mFortune’s jib check out some of their other download mobile slots games. Cat & Mouse offers a similar Progressive Jackpot for players, while Pirates Treasure is a good example of what you can achieve with simple, easy-to-trigger bonus rounds and no-nonsense graphics.